Sixpence For Your Shoe: Make it your own! In my daily web browsing for new ideas and unique inspiration, I can across this absolute knock out of a bridal shrug. It is sweet and sensual, feminime and sophisticated, delicate, yet bold all in one. Oh so appropriately named "A Fallen Angel" I have totally fallen for it. Its divine! 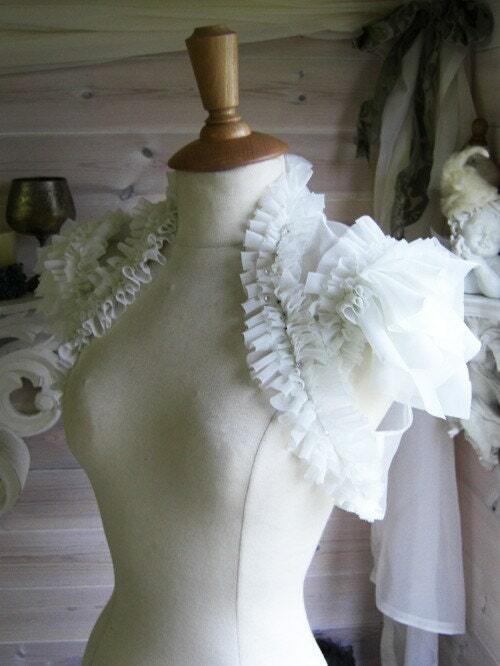 "A Fallen Angel" ruffled bridal bolero is a sheer feminine bolero with a couture whimsical edge. Layers of ruffled chiffon adorn the front edges and create a dramatic neckline whilst layers of soft chiffon drape over the shoulders. The movement in this piece is pure romance, a gentle sashay of ruffled chiffon layers caress the wearer. I am always looking for ways to give my clients ideas on how to take something that can be considered ordinary and turn it into something spectacular. Pair "A Fallen Angel" with a simple and structured trumpet gown like Style 8051B from Watters and you will absolutely be turning heads. Yes, I realize this gown has been on the market for years now, but it happens to be a perfect example of transforming something mainstream into something truly your own. And the best part, this entire look which screams high style, can be yours for less than $1,500. Thanks ever so much for sharing our work with your blog readers, we are chuffed that you enjoy our designs and really enjoyed reading your lovely comments. Thank you for supporting independent Irish Design, its a please to be featured on such a stunning blog.